Noah's Ark was established in 1996, as a community development organisation, by a group of individuals from diverse backgrounds seeking to serve the Muslim community of Glasgow. Its primary aim is to encourage and strengthen engagement between Muslim and mainstream communities for better mutual understanding. 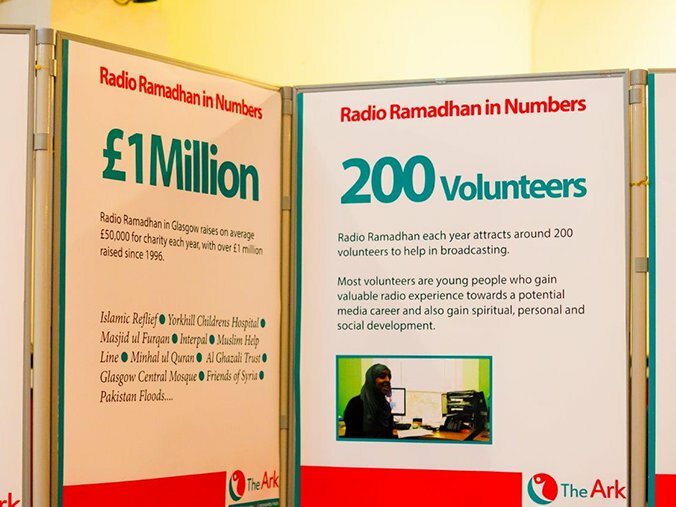 The first project initiated by Noah's Ark was the RSL Radio Ramadhan project to help galvanise Glasgow's Muslims towards the spirit of the Muslim holy month of Ramadhan. The response from the community towards this project exceeded all expectations as it immediately resonated with all sections of the community. The momentum created by Radio Ramadhan was impossible to resist, the following year saw Noah's Ark join with Glasgow City Museums to promote a spectacular showcase of Muslim art and culture throughout all Glasgow Museums called Salaam. This was accompanied by a special RSL entitled Radio Salaam. The work of Noah's Ark has constantly been community focused providing it a platform and voice, As a result Noah's Ark has helped bring into inception 2 key organisations to address visible deficiency gaps around education and provision of resource for the Muslim community. Although Noah's Ark has continued to support a number of community events over the years, it's most assiduous service remains the charity fund raising work. For over 10 years during the Muslim holy month of Ramadhan, each year, Noah's Ark has collected donations on behalf of numerous charities, raising an average of £75,000 each year. The charities to benefit from this have included; international relief charities as well as local charities such as the Yorkhill Hospital. The spirit of community and the radio's popularity remain the driving force behind Noah's Ark; inspiring hundreds of individuals towards volunteering and providing a much needed service to the community. Noah's Ark has over the years, built strong partnerships with many other community organisations; it intends to continue such partnership work in the future. Noah's Ark's membership is made up of volunteers and is open to all people. The management structure includes Board of Trustees and Board of Management who are selected by the Trustees. The day to day running of the organisation is undertaken by management board which comprises of the most dedicated volunteers who have risen to the level of management. Dr Salah Beltagui: Retired university lecturer in energy and the environment engineering, long term community and interfaith activist. Nawaz Ali: IT Expert with strong association with community work for over 20 years. Has provided technical expertise to numerous community projects allowing them to remain cutting edge. Sajid Quayum: Extensive professional experience in TV and film production, including with BBC and STV. Heavily involved with community youth work in Glasgow for over 25 years.